This production of Shakespeare’s A Midsummer Night’s Dream by the ever-excellent Propeller company is stripped down to a running time of just over an hour – the cast is also stripped down to their long johns, to which they add a cloak here or a hat there to enable them to double up on roles. Robin Goodfellow aka Puck (aka Tam Williams) narrates, providing a nifty spot of exposition to cover scenes that have been mercilessly excised from the text. Gone are Duke Theseus and Queen Hippolyta. Gone too is Hermia’s father, taking with him the darker, more dramatic aspects of the story. Here, director Edward Hall and his co-adapter Roger Warren focus on the entanglements of the romantic comedy, along with the broader slapstick of the ‘rude mechanicals’. It all tears along at breakneck speed and is as slick as it is funny. Which is extremely. The cast provide their own sound effects and backing music as they hurtle through the plot. Chris Myles is an imperious fairy king Oberon and a bombastic bully Bottom, a ham actor who, had there been any scenery, would have chewed it. Antony Jardine is a dashing Demetrius (well, there’s a lot of dashing around by everyone!) and an affable Peter Quince. Max Hutchinson’s coolly feminine Titania contrasts with his tightly-wound Helena, while Matthew McPherson’s Hermia rants and raves with an abundance of physical exertion. Oliver Wilson’s Snout is a groovy mover, as opposed to his hot-headed and more courtly Lysander. It is Tam Williams’s Robin/Puck that holds the thing together, charming in his tutu and playing a mean trombone. The comic business is tightly choreographed and cartoonish in places. The attention to detail and the handling of pacing are delightful to behold. The text is clearly delivered, with Shakespeare’s rhyming couplets heightening the fantastic elements of events. The Pyramus and Thisbe performance, which I maintain is the funniest scene in all Shakespeare, is hilariously chaotic. Without the heckling of Duke Theseus and his courtiers, its silliness rattles along uninterrupted. Aimed at young audiences, this Dream is an engaging, enjoyable, exhausting if not exhaustive introduction to the play, and to Shakespeare. If the reaction of audience members of every age is anything to go by, Propeller delivers a cracking night out for one and all. 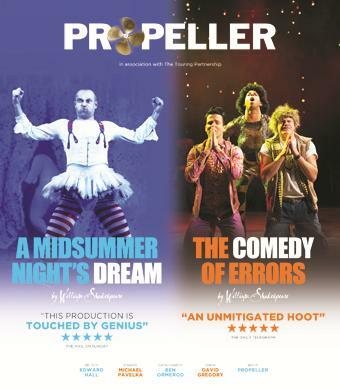 Propeller’s first visit to Birmingham brings a double bill of Shakespeare’s Comedy of Errors and, the show I saw, A Midsummer Night’s Dream, giving the people of our second city the chance to see this all-male troupe bring their inventive and accessible takes on classic plays. Edward Hall is surely the most reliable director of Shakespeare – I have yet to see one of his takes on Will’s plays that I didn’t enjoy or admire. Here, he dresses his cast as street performers, pallid clowns or saltimbanques. They don bits of costume to identify them as main characters or otherwise blend into the chorus, flitting and running around in a swarm of activity. The aesthetic never obscures the action and the verse is spoken with clarity and emotion – I defy anyone to fail to be charmed and transported by the production. It’s also very funny. Matthew McPherson is a pouting, petulant Hermia (and also doubles as Snug the Joiner) contrasting splendidly with Dan Wheeler’s taller and heartfelt Helena. There is a fantastically funny brawl between these two, helped and hindered by their bewitched boyfriends, Demetrius (Arthur Wilson) and Lysander (Richard Pepper). This scene was the comic highlight of the evening for me, outshining the Pyramus & Thisbe interlude, which I feel is a little too manic and overdone – However there is much to enjoy in Chris Myles’s Bottom. James Tucker is an elegant and haughty ‘proud Titania’ and Will Featherstone rounds out his Hippolyta, making her a character rather than an ornament for Theseus (an excellent Dominic Gerrard). The female roles are never impersonations or drag acts; the actors evoke femininity with gestures and attitude, while keeping their maleness apparent. Joseph Chance is a merry, balletic puck in striped red and white tights and frilly tutu, while Darrell Brockis’s Oberon is the master magician in sparkling cloak, while David Acton’s impassioned Egeus memorably establishes the conflict that triggers the rest of the plot. It’s a prouction that uses theatricality to bring out the magical aspects of the story, but the tricks and gimmicks are all in service of the script, proving yet again that Propeller is the go-to company for intelligent, effective interpretations that actually work as entertainment. Using the remains of the castle as a backdrop, the stage nestles into the bailey’s slopes and dips with a simple evocation of the forest and the palace of Theseus. Elegant pagodas are dotted around, the largest of which serves as a bandstand; as the audience arrive, the Mechanicals treat us to a light-hearted concert of Gilbert & Sullivan numbers. The setting is Edwardian and a little bit colonial but director Peter Rowe doesn’t labour the point. 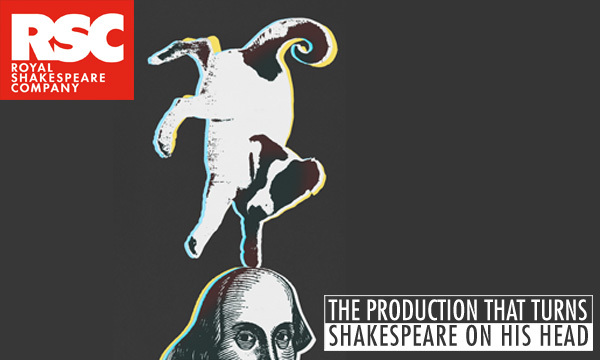 By keeping things simple, he allows the comedy of Shakespeare’s script to hold centrestage, proving you don’t need gimmicks and ‘clever’ reinterpretations to make a production accessible and effective. Quite simply, it’s one of the funniest Dreams I’ve seen in a long while. The ensemble of four young lovers is intensely presented. Hilarious when they’re under the influence of Oberon’s love-juice (sic) and rowdy when their passions are aroused, this quartet demonstrate physical comedy that belies the elegance and formality of their period costumes. Jennifer Greenwood is a fireball of a Hermia, contrasting with Georgina White’s neurotic Helena. Eamonn O’Dwyer is a poised, slightly stuffy Demetrius but it is Craig Fletcher’s dashing Lysander who gets most of the laughs. As you’d expect, the Mechanicals are delightful. An affable bunch directed by Phylip Harries’s Quince, they prepare their production of Pyramus & Thisbe in the woods. Interestingly and very effectively, their version is a cod operetta, continuing the G & S motif. It works brilliantly, thanks to Greg Palmer’s musical direction and composition. James Haggie’s Thisbe is a scream, Paul Kissaun’s Lion is adorable (such a contrast between this actor’s Snug the joiner and his Egeus!) but of course, it is Bottom the weaver who dominates. Eric Potts shows himself to be a wonderful Shakespearean clown, stepping outside his customary role as pantomime dame. His Bottom is rounded, cheeky and pert. Simone James is aloof as Hippolyta and graceful as Titania, followed by a troupe of fairies; the otherworldly aspects of the production are simply and stylishly achieved; the overall effect is magical. Robert Fitch’s Oberon is more commanding than his Theseus, but then the fairy king has mischief to be done. His servant Puck, for me, steals the show. Lanre Malaolu gives an excitable Puck, a ball of pent-up energy, a nifty little mover with some fine comic playing. A dream of a Dream, then. Already I’m looking forward to hearing about next year’s production.